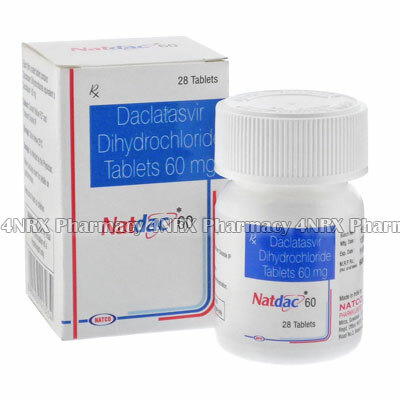 What is Natdac (Daclatasvir Dihydrochloride) used for? How should I use Natdac (Daclatasvir Dihydrochloride)? For most cases of Hepatits C treatment, you will be prescribed a dose of 60mg (one tablet per day). Treatment will often be for a 12-week period. Follow the dosage instructions for sofosbuvir and ribavirin as provided by your doctor. What are the side effects of Natdac (Daclatasvir Dihydrochloride)? Daclatasvir and Sofosbuvir when taken with amiodarone can result in a serious side effects called Bradycardia. Thisis an unusually slow heart rate. If notice any of the following while taking this combination of drugs, contact your doctor immediately. Other side side effects you may notice are generally mild and temporary. Headaches and tiredness can be caused by daclatasvir and sofosbuvir. Anemia (low red blood cell count) and nausea can also occur if you are taking ribavirin. Daclatasvir is intended to be used as part of a combination therapy with sofosbuvir or with sofosbuvir and ribavirin. Make sure you are aware of any safety information about all drugs you are taking as part of this treatment.